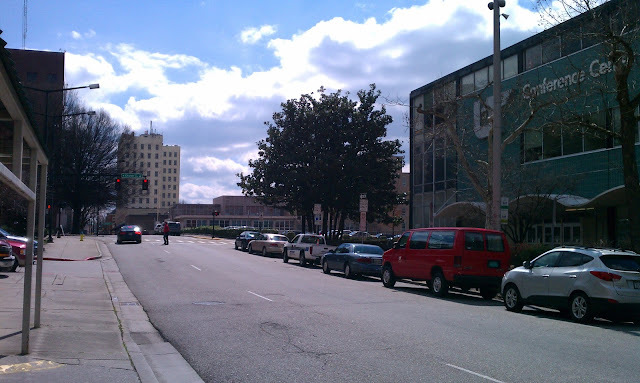 At the corner of Henley Street and the Clinch Avenue viaduct, stands an early 1980's building. It was built during the construction of the World's Fair Park, when the old rail yards were reborn into a global stage. The building was perhaps the most practical of all the structures built for the fair as it soon housed the Knoxville administrative offices for the State of Tennessee. It has served that purpose for over thirty years, however, that is all soon to change. Recently, the local newspaper has announced that the state has agreed to sell the state office building to a local developer/hotelier, who also owns the adjoining Holiday Inn. He intends to turn the state office building into the fanciest hotel in Knoxville. Story Here. Called the Tennessean, it will boast sleekly designed, large, luxurious rooms. The plan is promising, mostly attractive, and offers a sensible path to reuse a large but otherwise unremarkable (to some) building. A building designed to house state offices will be repurposed to become a hotel. Ironically, diagonally across Henley Street the State of Tennessee demolished a hotel in 1964 in order to construct a building to house state offices. If one were to go to the site today, there is not much to see. 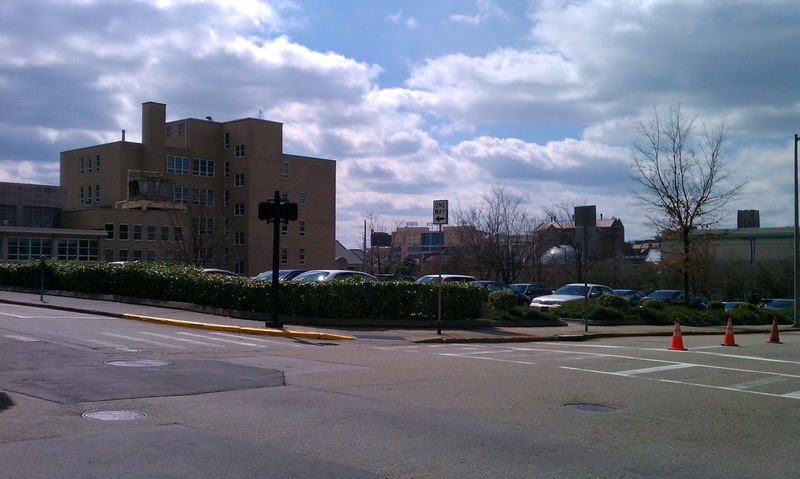 Fifty years after the state announced plans to expand its offices next to the Tennessee Supreme Court building, fifty years after it laid a wrecking ball into the side of a once popular landmark downtown, the spot is still a surface parking lot. 614 W. Church Ave. Another surface parking lot. Granted, among the surface parking lots downtown, this is one of the nicer ones. The lot seems dedicated to employees of the state or those working at the Duncan Federal Building across the street. It does, however, host many excellent tailgates during football season. The parking lot at the corner of Church and Locust. The old state office building in the background. 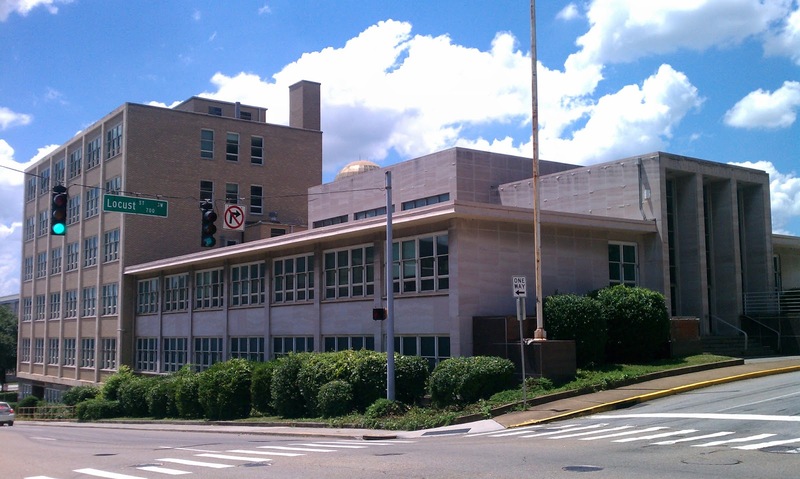 The Tennessee Supreme Court moved to this block in 1954, when the new Supreme Court building was finished. The new building was a striking, sleek, and fully modern design. Adjoining the main court building was a six story brick building that housed state offices. That building served as the main state office building until the 1980's when they moved into the building at the World's Fair Park. The court building served as the home of the Supreme Court in Knoxville for over half a century until the court moved into new digs at the post office across the street. A decade after the court moved into the mid-century modern structure, in 1963, the state announced intentions to build another multi-story building on the block. Almost immediately, the stately building on the corner was torn down. The state never built the office building it claimed that it needed. Ironically, the mid-century modern court building now sits vacant and finds itself on Knox Heritage's Fragile 15 list. As it's architecture has long been out of style, many fear that the short sightedness of the past will prevail and this building too will be lost forever. The 1954 Tennessee Supreme Court Building. Mid-Century Modern styling with pink Tennessee marble construction. You may be asking what exactly the state tore down in order to not build a promised building. Let's take a look by returning back to the corner. The site as it appears today. The same site in postcard glory. The UT Conference Center was Rich's department store at the time. 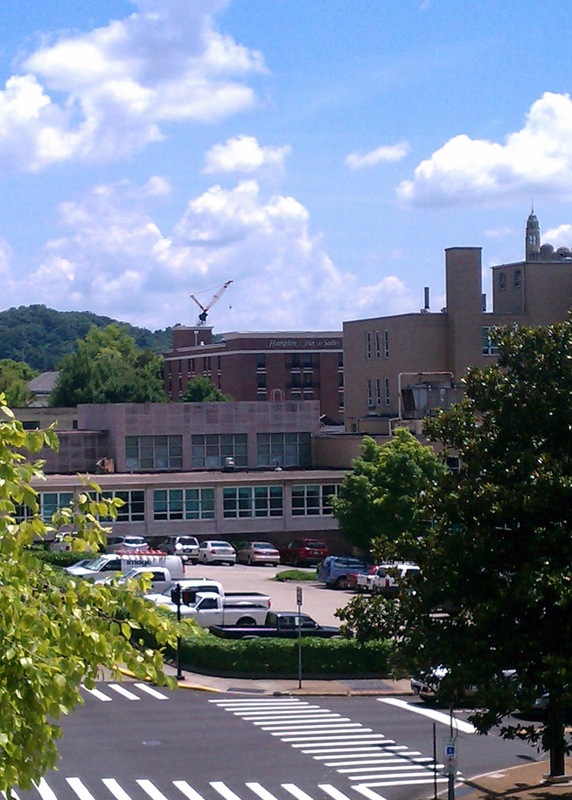 Note the Medical Arts building in the background. On this site once stood the Hotel Arnold, née Arnold Apartments. The Arnold was built in 1923. It was named for M.D. Arnold, Sr., a prominent Knoxville businessman. He was one of the sixteen businessmen who were often referred to as "Knoxville's merchant princes." Before he moved to Kingston Pike (home still standing), his home was on this site before the Arnold was built As strange as it may seem, given that many hotels began life as hotels and then became apartments, the Arnold started as apartments and became a hotel. The Arnold Apartments, pre-hotel days, just after completion. The apartment building was converted into a hotel in 1928, just 5 years after it began life as apartments. Hotel Arnold with new sign and awning. The hotel was five stories tall and boasted 150 rooms, each having a bath and ceiling fan. It was concrete, steel, and brick construction with cast details. The building was arranged in a classic H shape with two large wings joined by a central corridor. The massive gables at the top were purely ornamental. Hotel Arnold Lamppost, you've arrived. The Arnold wasn't one of Knoxville's fanciest hotels. the Andrew Johnson and the Farragut duked it out for that billing. It was more along the lines of today's 3 star hotels, competing mainly with hotels like the St. James and the Atkin. In 1959 a single room would run $2.00 and up, $3.00 for a double. That would be about 2/3 of the rates at the AJ. The Arnold was a popular choice for those coming in to see the Volunteers play football, probably due to its proximity to campus. It almost always ran large ads in the programs. The Arnold also was host to a nice grill on the bottom floor. If one were to be shopping for historical postcards of Knoxville, the Arnold would undoubtedly turn up. The management seems to have spent a fortune on postcards. It looks like a decent place to stay if you wanted to see the General Neyland coaching the Vols. Alas, the state purchased the hotel and its parcel in the 1950's for $250,000.00. The hotel continued to operate for a few years, but by 1962 it had closed and by 1963 the building was reduced to rubble. Hotel Arnold from the Knox County Courthouse. It is to the left of St. John's pyramid roof, to the right of the Candy Factory. 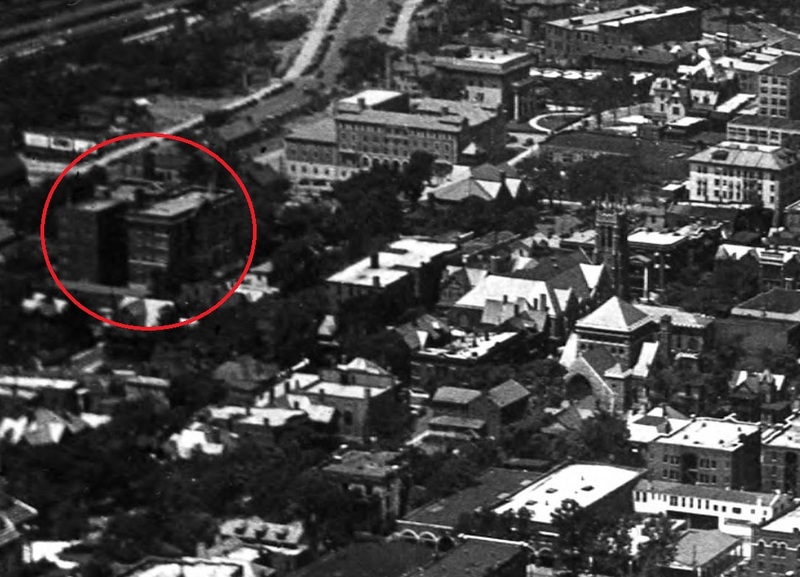 The same shot, Hotel Arnold circled. Note: First Baptist Church upper right, St. John's Episcopal upper left, Masonic lodge lower left. Same shot with Hotel Arnold Circled. Note: St. John's Episcopal center right, YMCA and Masonic lodge, top center. Hotel Arnold site circled. Note: St. John's Episcopal top center, YMCA and Masonic lodge lower left. While it may be ironic that a hotel was demolished for a state office building that never materialized and now a state office building is becoming a hotel, it may be even more ironic that this site has been floated several times as a possible new hotel. The above project was interesting, but it never came to fruition. Nick Cazana is doing excellent things on the other side of Henley Street and his proposal was for the Supreme Court site was exciting. Unfortunately, we will never have another Hotel Arnold. Yay, a new post! Wouldn't it be fun if someone bought the old parking lots and rebuilt structures reminiscent of the old buildings? If I had unlimited funds that is what I would do. The Hotel Arnold looks much nicer than what's there today. Another great blog post. 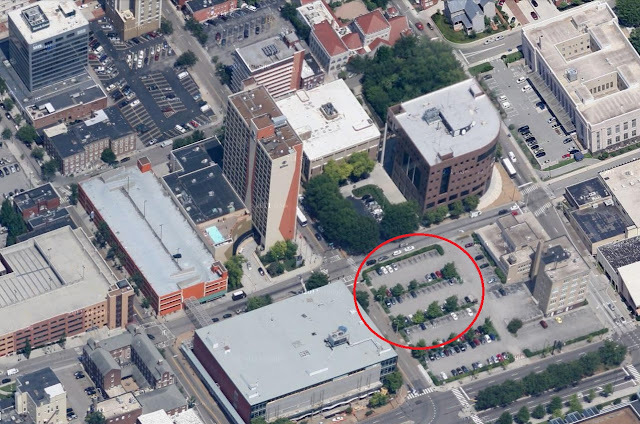 I think I'm correct that the building that borders the parking lot has been offered for redevelopment, right? You pictured it in the blog and I photographed it yesterday thinking I might mention the fact. Urban Guy, that is correct. There is currently an RFP on this site, including the parking lots. At one point, this site was going to be the "convention center hotel". There was a referendum and the voters voted to disallow the city from funding any such thing. That idea died. 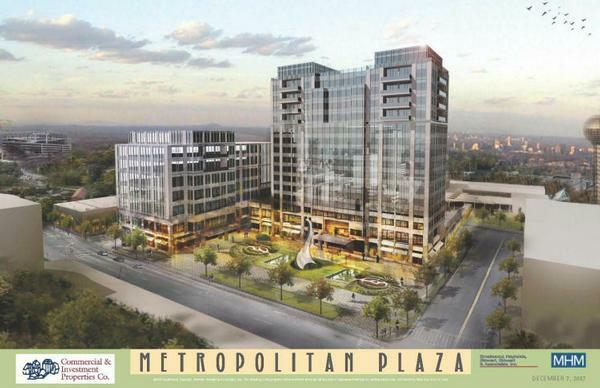 Then Metropolitan Plaza came about but the economic downturn killed it. Now anyone with a good vision, financing, and connections can get a stab at developing this block. Maybe Andrea can save the court building and rebuild the Arnold. I had seen the postcards in a number of collections, so it was great of you to fill in the details. There are many of us who are waiting and wishing--waiting for news of how redevelopment of the block goes…and wishing we could be involved somehow. Hey there. I really enjoy your blog, and I was wondering if you might have any pictures of/information about the old Eddleman's grocery store that used to be on Neubert Springs Rd. in South Knoxville? I have searched for pictures of what it looked like back in the day, but haven't come up with anything. Thought you might be able to help! Looks like M.D. Arnold was a big shot. He had a nice house and a swimming pool as well! If you are a fan of this building, take a trip to Atlanta. The exact copy exists at the corner of Peachtree & 6th in Midtown. Designed and built by J Neel Reid as the Peachtree Manor the same year. The exact replica was built in Knoxville as the Arnold. The Manor has been restored and is a condo building. I live there. It's beautiful. Well, that's very cool. It's a spot-on duplicate.